This year has proven to us that we can provide top notch service to our customers, even under heavy pressure and work load. Many of our work days have been filled to the limit, yet somehow we manage to make your events on time. We did experience two problems this year, the first one we were late to she was given compensation for the inconvenience, the second one occurred when one of our drivers accidentally loaded up the wrong inflatable and noticed the mistake at time of delivery, which set him back nearly two hours. Managed to get all of his rentals done on time that day though. Every now and then you might find a flaw in our equipment, please call us to let us know. We don’t get to inspect all of our equipment before they go out, so I would like to know if there is something that needs to be addressed before it goes out again. Things like a little hole/tear, clogged water system, cut cord, and etc… If I can repair the issues as they come up, we can help to ensure the problem is not present on the next rental. Bounce house party rentals can be awesome if planned properly. You MUST keep in mind that inflatables require power with close access. We bring out cords, blowers and anchors as needed, but if your electricity is inadequate you may experience some delays in setup. Many of our units require more than one blower, for these inflatables we need to have access to more than one electrical outlet on separate circuits. (Separate circuits mean that two or more outlets are connected on different breakers.) Have you ever ran your hair dryer and microwave at the same time and tripped the breaker? If yes, then those two outlets are on the same circuit. Make sense? We need circuits that will not overload when we engage our blowers. If you are not sure which breakers are on separate circuits this might help. This list is an outline of how many older houses are wired. This can give you a general idea of what all are connected to the same circuits, just because you are in a different area of the house does not always mean you are connected to a separate circuit. For proper bounce house setup, we will help with diagnosing power problems to an extent. However, we will not spend a lot of time trying to figure out which outlets are connected and what breakers to reset. There have been times where we spent over an hour trying to figure out customer electrical problems, this is something that we cannot do. We are not being hired to fix your electrical issues. Make sure you know where your breaker panel is, test a few breakers to find what they are connected to. You could also call an electrician to come out to house and help explain it you as well as show you which outlets go to what circuit and how much load they can handle. Sometimes your breaker might be tripping because it is beginning to fail and needs to be replaced. We want your Inflatable Party rental to go as smooth as possible, so having these issues addressed in advance can be really helpful in getting you party rental setup in time. Kansas City has a wide variety of home ages and styles, the electrical wiring on them can very different. If you are in doubt, call a proper licensed electrician. Big Party with Dunk Tank, Giant Slide and Large Castle. Add Cotton Candy and SnowCones. electric outlets. If we get there to setup your inflatable rental, and you have not addressed your power problems, you will still be charged the entire rental amount in full. We sometimes have generators available for rent, these are on a first come, first served basis, and are generally rented out in advance. We DO NOT provide you with a generator. This is a separate rental item and we only have a limited quantity. YOU can rent a generator from HOME DEPOT TOOL rental locations, or other tool rental locations, keep in mind many tool rental places are closed on the weekends, so you may have to rent it on Friday and return on Monday. They all keep different hours, so do you homework before your party to find who is going to open and closest to you just in case you need to run and grab a generator at the last minute. Generators come in a wide array of sizes, we will help you identify how big of a generator you will need to rent. RULE OF THUMB: Need about 10-15 AMPS per Blower. If your inflatable rental is going to require 4 blowers, you can expect to pull 40-60 amps of power, which means you will need between 4400-6600 watts. Always choose a generator larger than what you need, they are not designed to run at max power for a long duration of time. If we tell you 6600, you better get an 8000 watt generator. Better safe than sorry, if your generator overloads, it can sometimes take up to 20 minutes to get it all back up and running again. Many tool rental places charge between $60 & $110 per day for an average generator. Not sure what size to get, call me when you have decided which units you are interested in, I will be happy to give a good idea of which one to rent. I know this seems like a lot of information, feel free to call me with any questions related the power your rental will need, I am always happy to go over it with you. It is my goal to make sure your event goes as planned with no HICCUPS. Inflatable Bounce House Rentals are what we do. We have setup nearly one thousand parties, I know the metro, I know the parks, I can provide you with the information you need to know, just have to call and ask. Bounce House parties are always a good time when properly prepared for. We try to take all the stress out the entertainment arrangements. When you book with us, you can count on us to be setup on-time and ready to go before your party starts. If you are nervous about the setup time, start your reservation an hour early, we will make sure to be setup by the time on your reservation. If you give yourself an hour buffer, it can help with unexpected delays, such as transportation & traffic troubles, electrical issues, setup problems, and what not. We make every attempt to setup all inflatable rentals as far in advance as we can. Some days we might 10-20 rentals to handle and may have to quick about the setup process. We would love to stay and chat, but sometimes we can’t because we don’t want to be late to the next Birthday Party Rental. Please do not confuse our haste for being rude, we just want every party that day to go perfectly. If you are renting a WATER unit, YOU will need to provide the water source. I know it sounds silly but we do not carry around thousands of gallons of water to provide for each event. You must have a water source close to the setup area, we typically only bring a 50 foot hose with us to most rentals. It is always best that you supply the hose, have it connected the water spigot, and brought to the setup area of your choice. This helps to save on time delays, we can setup the equipment quickly and get your water flowing as soon as we are done. WATER UNITS REQUIRE WATER AND DO MAKE A WET MESS!!!! If you are nervous about your yard getting muddy, be certain that it will get a little muddy right around the exit and entrance of the water ride. We usually have tarps with us to lay down around those areas which will help protect your grass, sometimes we have ran out of tarps by the time we get to our last rentals. If in doubt, have a large tarp ready for us to use when we set up, this can just help ease your mind as well as streamline our setup process. We like to provide you with a clean inflatable for your party, so don’t be surprised if you see us out there rinsing it off after we set it up, sometimes our units get picked up and rented back out so fast, we don’t have a chance to clean and inspect them in between. If you see bubbles in the Inflatable rental, don’t be alarmed, this is perfectly normal when an inflatable rental has gotten wet, or recently cleaned. This will happen if the unit gets rained on as well, the bubbles usually go away within 15-30 minutes as the seams dry out. If it bothers you, while our setup personnel are present ask them to give it a wipe down. They are always happy to assist with things like this. I find it easier to just send a child in with a towel, they always end up having more fun in the wet and slippery bounce house. Our Water Rides and Water Slides will many times show dirty areas from the previous yard, our guys try to keep an eye out for this and rinse it off after setup, but might forget, feel free to ask them to give it a quick rinse before they leave. This usually only takes a few minutes. If they have already left and you notice a little bit of dirt, or some sticky candy, you may also feel free to spray it out with the hose. Like I said, I usually just send my kids in with a hose, they are always so happy to spray each other while cleaning the bounce houses. We do what we can in the time that we have. We have been so busy this year, that most of the cleaning process has to take place at either the tear down or setup process because we don’t have any other time to get it done. We take pride in the service we offer! I have spent a lot of time making this service possible to you. Please at least give me the respect that if you make a reservation and change your mind, give me a call to let me know. This way we don’t show up to setup and find that your are not there and not answering the phone, or tell us that you changed your mind. These units are very heavy, take a lot of energy to lift and moving them around is not easy. I would rather find out that you are cancelling the night before you are scheduled, this way we don’t load it up on the truck. There have been so many people do this to us this year, you can thank them for me being more strict with the deposit requirement. If you would like to reserve a bounce house, be prepared with a credit card that has at least $50 available on it. If you do not have this available, I will not HOLD the equipment you are requesting. Of course many of our loyal customers might get some leniency to this rule, because we have built a good relationship and they know that when we say we will be there, WE WILL BE THERE, as well as we know they will be too. The deposit is NON-REFUNDABLE unless the case of IMMINENT bad weather noted on the morning of your event. Don’t call a week in advance and expect to cancel because the weather report shows a 40% chance of rain a week away. I know it sounds crazy, but we really do get calls like that. Our services have expanded a lot in the past year. 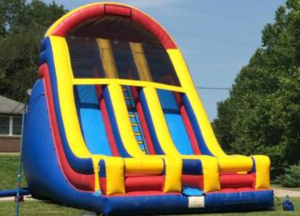 We offer Bounce House Rentals, Inflatable Obstacles, Combo Bounce Houses, Water Slide Rentals, Slip n Slide rentals, Dunk Tank, Bungee Run, Cotton Candy rentals, SnoKone Rentals, Even Disc Golf Rentals and other Interactive Games. We are trying to build a one stop shop for you party needs. If you have ideas of items that you would like to see us carry, feel free to let me know. I will be happy to entertain the idea. I had a customer the other ask about Disc Golf, and immediately went out a bought an entire setup. Look forward to renting this out soon. We add as we can afford to expand and as the ideas come in. I think next up will be Jousting and Sumo, have received a lot of calls for that stuff this year. A couple ideas came to me last night as well, considering adding party supplies to our inventory. Packages that include party cups, plates, napkins, favors and other decorations. If I can find a good supplier I will try to get this added before next season. Give me your thoughts, I would love to hear from you. Well I suppose I have vented enough for one day. Look forward to helping with all your Birthday Bounce House Party Rentals in Kansas City. PARTY ON, KANSAS CITY, PARTY ON!!!! Party Inflatable Rentals Available NOW!!! Bounce House and Inflatables are always a big hit at any party. Birthday parties are always the best when there is some inflatable entertainment going on. We have helped with some pretty intense parties already this year. Don’t miss the opportunity to book your event. Weekends are filling up fast, don’t wait to make your reservation. We are adding several new units next week. You will get to see them under soon. We are so excited to be able to offer Kansas City families so many different bounce house and slide rental options. We feel that it is very important to have a diverse collection of equipment rental options. Every year will be adding to our inventory. Have gotten some interesting requests that we will be trying to fulfill in the years to come. Our New Popcorn Machine arrived the other day. It look very nice. 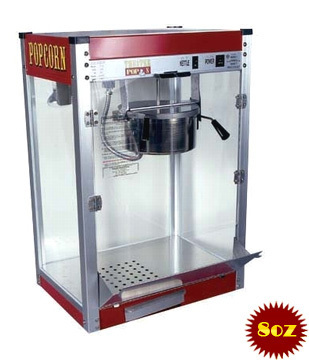 It has a large kettle for keeping up with crowd, as well as a bottom warmer to keep popcorn hot n fresh. Really excited to get it rented out this year. Think we will be testing it’s functionality this week. Call now to make your birthday party or corporate event rental reservation. Inflatable rentals are always a big hit at birthday parties. Adult parties can benefit from bounce house rentals as well, they help keep the kids entertained, of course Water Slide Rentals are always a perfect option for Grown-Up parties. The 38′ Obstacle Course Rental is proving to be one our most popular inflatable rentals here in Kansas City. We will be looking to add another one, maybe an Obstacle that is even bigger. We are also hoping to be able to open up a formal shop to work out of. Running bounce houses from a retail/flex space would be much more convenient. Also we will be offering computer services provided by www.mygeekusa.com. They have an impressive track record for keeping Kansas City Computers running smoothly and virus free. They also offer iPhone, iPad, Android, and Laptop Screen Replacement. The weekend ritual of writing the schedule, cleaning the equipment, getting up early to load the trucks, driving all day for deliveries is once again upon us. Spring is coming super fast this year! We already have 5 rentals for March, and it just started. Thank you Kansas City for being such a fun and happening place to live. Parties around every corner of this Paradise in the Heartland. We are pleased to be a part of all that happening. Sure we don’t promote big events with the next big pop star. Kids certainly love it when we show up to make their birthday party big hit. Busting out the Moon Bounce Houses, Castles and Obstacle Courses, Slides and Dunk tanks. 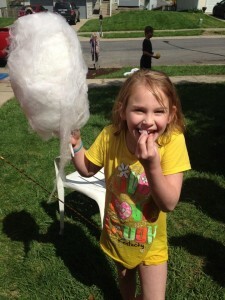 Sugar blast them with some fresh Cotton Candy and it will be a grand party, hard to be outdone by the neighbors. beginning of Summer for all the kids that don’t have school. It’s more like a “Congratulations, you passed” kind of party. Kids from all ages. Our neighborhood consists of mainly children ages 7-13, all ages are certainly invited to this shindig. Plans for the day include: Neighborhood BBQ Contest, A local DJ, maybe some Karaoke, Water Slides, Dunk Tank, Bounce House and Obstacle. It’s a great way for all the neighbors to get to know one another. One big FIESTA!!! entertained for hours of grown-up party time. Yes, of course, even grown-ups can play on the bounce house and inflatable equipment too. We have had several calls lately asking about weight limits on these inflatables. I am not a little guy, and get up there myself with the kids every now and then to have fun, as well as perform the cleaning rituals that are required from time to time. The Large Castle has a 1000 LB weight limit per the manufacturers label, some of the others are upward of 600-800 LB limits. The Dunk Tank can easily handle up to a 350 LB person on the seat. It is constructed of all welded steel parts, it is built to be a tough and long term investment, cost a small fortune too. 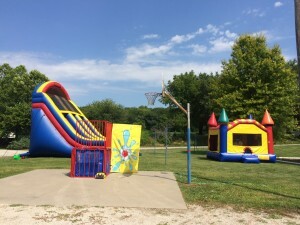 Call or email now to inquire about your Moon Bounce House Rental for the Kansas City area. We have many to choose from, take a look at our inventory at the top of the page. 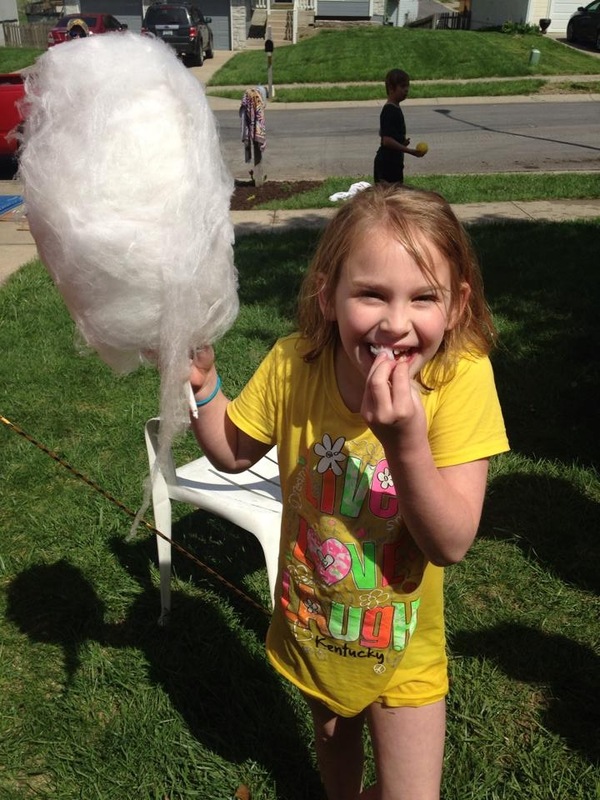 You are certain to find something that will make your little one’s party a major success. Bounce Houses are great for all ages and all events. 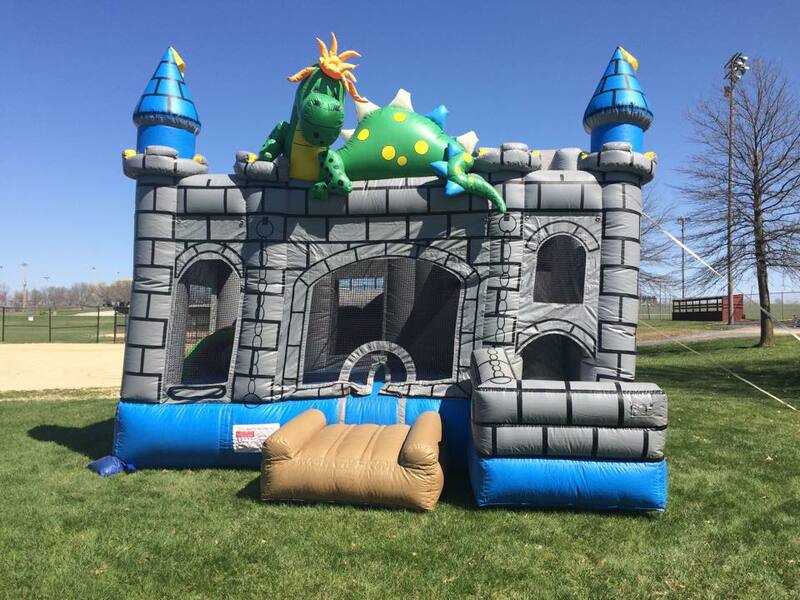 Rentals of Bounce Houses are very common with school carnivals, school fun days, and fund raisers. Churches frequently rent inflatables for their fun days to kick off the nice weather. Corporate events are always a big success when you bring out our big inflatable slides and bounce houses. There just isn’t much out there that can entertain a crowd like giant inflatable castles and slides. Well this year is already proving to be our busiest yet! We already have appointments set for April, May, June, and August. Still have plenty of availability but don’t hesitate to call to set up your party, we will be filling up fast. Don’t forget we are going to Florida this month to buy a bunch more equipment. Big giant long water slides with pool and slip n slide attachments. Combo units. Cotton candy & snowcone machines. Just bought a popcorn machine a couple days ago. It should be arriving within the next week or so. Pass us around. Talk to your friends. Plan your parties and corporate events or fund raisers. We are getting prepared to take on the really big events. If you have used us in the past, please write a post and tag this page on there. Other people truly are interested in hearing your feedback and so are we. This is how we improve our services and exposure. We are at the point where we need to hire a few good people. If you know someone that has what it takes, have them give us a call. Heavy lifting and driving skills required. There isn’t much work out there as exciting as this. Pays good too.